Can intuition lead you to a new career? Today I have the pleasure of introducing readers to Farnoosh Brock of Prolific Living. In this interview Farnoosh shares the fascinating details of how she became a successful entrepreneur by following her intuition. Farnoosh tell us about your new program: Smart Exit Blueprint. Angela, I believe the hardest part of leaving a job that is no longer serving you well is making that transition. Even if you know exactly what you want to do, you may still be at a loss how to make that overwhelming transition from your current job and income to your dream career. It is really important to pay attention to your intuition and your gut feeling during the whole process of leaving and then combine that with practical how-to to build a smart strategy to make the shift. So my Smart Exit Blueprint is a step-by-step guide to help you build that strategy to make a professional and successful transition from where you are – which is not the right place for you – to where you know you can thrive. You know, thanks to your intuition rather than what others tell you, that you are meant to do something special with your talents and skills. My course empowers you to get there. Who would most benefit from Smart Exit Blueprint? Great question. For starters, this is from my perspective and I worked in a start-up first, then transitioned to Corporate America in a large Fortune 100 company, where I worked and thrived for 12-years, and transitioned into several organizations and jobs within that corporation and then finally, transitioned out to self-employment and building my own company. So if you are in a start-up or in a corporate position and unhappy with your position and yearn for doing fulfilling work with your life, this course will suit you ideally, and it will guide you to finding the RIGHT place for you. I want to add that the right place may be in another corporate position or a non-profit organization or retail or self-employment for you. 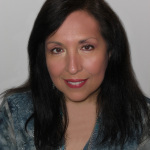 Your own insight and intuition knows where you are meant to go, but I arm you with tools, knowledge, resources to better understand your own skills and hone in on your strengths, so if you are in an unhappy job and not sure where you can find happiness but know that the current place is definitely not it, then this course is also ideal for you! If you are in an unhappy job but believe that the economy is to blame or that you should stay put and that pursuing your dream is “unrealistic”, while I’d love to work with you but you may not yet be ready for building a smart exit strategy because I believe we create our own luck, our own opportunities and our own future. What led you to create this program? That’s an easy one, Angela. When I was looking to exit my corporate job, first I could not find a single resource that could show me the practical how-to, the real dirt on having those tough conversations with bosses and spouses and rallying up support and building up confidence and belief in my own intuition and insight. I found nothing except inspirational books and that was great but, it wasn’t practical. So after I went through several weeks and months of building my own strategy, I decided to document and share the whole process. I researched and built material for months and interviewed other experts and did case studies and created exercises and tools and worksheets that helped me and can tremendously help others leave miserable jobs and find fulfillment in their work. Can you tell us about your own background and your own exit from corporate America? Do you think if you had a mentor such as you are now going to be, it would have taken place sooner or gone better? Sure. Let’s just say nearly 12 years in Corporate America is more than enough for any lifetime. I had plenty of mentors and coaches, even at the VP and executive levels in the company but most of all, I regret not listening to my own intuition sooner. I regret not taking my own inner voice seriously and instead being swayed by society and peer pressure and family. One day I said, No more! I am going to do this,” and I have not looked back a single second. You won’t either if you are in the wrong place. I promise you that! Did your intuition play a role in leading you to make the transition from corporate employee to entrepreneur? Absolutely! As I mentioned earlier, that’s what I was ignoring all this time and I have to say, I was trained to be an engineer so the feeling side of things did not hold a lot of credit with my family and certainly not at my workplace. I was trained to think analytically and logically and all that is great but not when it comes to the real stuff, such as whether you are in the right place or the right relationship. For all of that, the day I started listening to my intuition was the day that my life started to turn around! I can’t overemphasize the role of intuition in my life if I tried! Had you ever considered being an entrepreneur before? If not, what made you change your mind? Not in my wildest dreams. I saw my brother go through dozens of start-ups and crash and burn many times. No way I was going to be that crazy! Granted entrepreneurship is different from a start-up, in that you don’t have venture capital money and employees and investors to deal with and in ways, it’s even scarier! What changed my mind is the realization that there has never been a better time to start your own business. Look at the opportunities around you! And again, thanks to my inner voice and my intuition, I decided that entrepreneurship is the only path to happiness for me. So far, I’m right on the money! How does a person intuitively know they are ready to make transition like you did? I wish we listened to that intuition more often, Angela. I really believe many people get to the point of readiness when they can no longer tolerate where they are. You see, I believe that the pain has to be great enough in the place you are right now in order to want you to make the move. And then, you need to listen very carefully to your intuition, the one you’ve probably been ignoring for a while, to tell you where you are meant to go. As to the how, it’s listening, meditating, reflecting, hearing those voices in your head and watching how you feel toward certain things. All of that will guide you to the right course for you. There were so many signs, I actually just recorded a group coaching call on this if you want to see it here: http://www.smartexitblueprint.com/blog/10signs. Some of the signs are extreme boredom at your job; lack of any focus, the intolerance with all the systems and policies and general authority, and the fact that you do it just for the money. Some of the more painful signs are when the company no longer aligns to your values, when you are in pain and doing everything that you know – thanks to your intuition – you are not supposed to be doing in this life. Please pay attention to the signs and at least be aware of your situation. You can change things. I promise you! I believe in your ability because I did it and I was the last person to walk out on Corporate America, trust me! How has becoming an entrepreneur changed your life? Oh I love my life. I may work 14-hour days, give up luxury and social life and hobbies, and see less of my better half – thank goodness I married an angel – but I am over the moon to have the ability to build an enterprise that is aligned to every part of my beliefs and values. It has transformed my life and taught me that I know best what is good for me, thanks again – can we say this too many times – to my intuition. You understand that one well, Angela, and I am so glad we share that value together. What advice do you have for someone who is “on the fence” about taking the leap? First one is that you need to bet on yourself. No one out there will ever bet on you and your gifts and your abilities. You need to believe that you deserve a shot at real success and it starts with self-belief. Summon it and take action. Second is that I think you have a moral obligation to share with us your gifts and your talents. I was just with my father-in-law who said to me not everyone is gifted, many just exist, they hardly live and they have little to offer. I disagreed so strongly I think I went overboard in my manners a little. I don’t think that’s the problem. The problem is that many simply don’t bother sharing their gifts. So please, share yours. Find a way because you have no idea how many people can benefit from your abilities until you do! Are you ready to escape from the 9 to 5 trap of trading time for money? Starting over as an entrepreneur is more than “make your own website” and booking business the next day. What questions do you have for Farnoosh? She’s done it so, take advantage of her expertise and ask her advice. If you enjoyed this post please share on social media. Thank you! P.S. 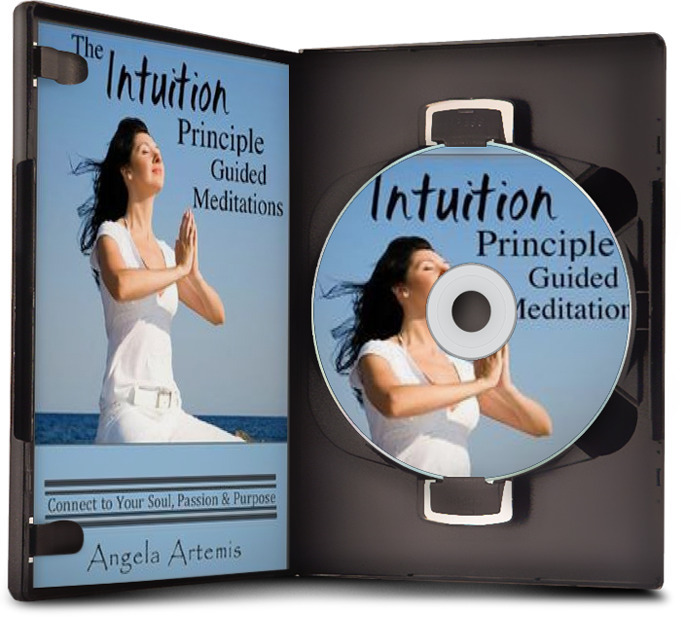 To learn more about listening to your intuition check out my books on Amazon (The Intuition Primer is a great book for beginners and it’s free to Amazon Prime members). At Barnes & Noble both online or at one of their stores. Farnoosh Brock left a 12-year career at a Fortune 100 company for her pursuits in writing, coaching, blogging and building her company. She talks about smart habits for rich living with a focus on helping people create a smart exit strategy out of the wrong job to their true path. Oh and grab the 14 weekly power career tips and uncensored corporate escape advice from here! Thanks again for a great interview — and a topic dear to the heart of a lot of us bloggers, so very relevant. I also walked away from a 15 yr. long career as an engineer (software development) and although I loved it, it was time for a change. I think the biggest surprise really is how much work it is. YIKES. You both are quite inspiring examples of the fact that it can be done, and impressively. Thanks for sharing your experience and knowledge, both of you. I’m so happy you found Farnoosh’s interview inspiring. Farnoosh lives the dream life of blogging and traveling the world! That’s some great achievement – I’m sure we’d all like more adventure. Wonderful interview and so inspiring for those of us who are giving blogging a try. It is a completely different mindset for me from my days went I was teaching 4th graders, But many of my interests, such as technology carry over and are helpful and I try this new venture. Thank you for sharing your insights. I’m so glad you enjoyed the interview with Farnoosh. I didn’t know you used to be a 4th grade teacher? I really enjoyed reading this interview with Angela! I’ve seen your name here before and now I’m heading over to your site and read more about how you left the life that wasn’t serving you anymore. I love my “day job” as a preschool and I love my “night job” as a blogger. Someday I may need to make a choice but for now I’m managing to balance both lives!! Great to have found you through Angela. Thanks Angela, for a great interview!! You’re going to love her blog! I love these 2 lines. First one is that you need to bet on yourself. Second is that I think you have a moral obligation to share with us your gifts and your talents. What a great call for action! As I’ve gotten older, I use my intuition more and more. I am intellectually aware of the importance of it. The challenge is always in the practice…not squelching that intuit voice and let logic take control. I’m so glad you got so much out of this fantastic interview with Farnoosh. She’s a great role model. I’m sure 99 percent of all bloggers are blogging hoping to make a new career out of it. Awesome interview…two of my favorite bloggers. I agree with Farnoosh, we have a moral obligation to share our gifts. They are needed today more than ever, I believe this is the path that will heal the world. Thanks for being on the leading edge and all that you do to inspire, motivate, and teach others. Anybody that works with you is one blessed person. Tess, you are a darling. Thank you for your support!!! Our courses go hand in hand because fear is a big factor in both of them. And I love the phrase “heal the world”. You are very kind and the encouragement goes a long way. THANK YOU for making my day, Tess! I worked in “Corporate India” for 13 years, then took the amazing decision to quit at the height of a successful sales/marketing/training career, when I got married at the ripe old age of 33.:-) The plan, of course was to take a 6 month break, since I was moving cities. Also, my employers were willing to, and enthusiastic about having me continue to work with them. Life had different plans, and my son came along, my mom who lived with us had health issues and I prioritized. We moved cities again – and it took us some time to settle down, this time with a baby and Mom’s frequent hospital visits. The funny thing was, I was so busy I never once regretted not going to work. It was a massive change for me – after all, I had to switch to regular casual clothes and flat footwear from three sets of formal wear per day (really!) and four inch heels. Time went by and I also switched from lipstick in my purse to fevistick in my huge tote bag. All in good spirit. When my son started play school at the age of 2.5, I got a part time job with only paid half a peanut. Still, it got me out of the house. I did feel a teeny weeny bit bad – as I was in touch with my ex-colleagues. They were growing rapidly and here I was, doing almost nothing. Or so I thought, forgetting completely I was managing my home and my kid and an office, even if it paid near-zero. I got over that feeling rather quickly, though – as I learned a lot. 🙂 The internet entered my life. And I networked – always loved interacting with people. At the same time, my job also grew into a full-time job. Anyway – enough details 🙂 – today, I have two jobs – I work as a full-time freelance writer from home and love it, and I am also part of an ethics committee that screens protocols for human clinical trials. Busy as I want to be. I’ve realized it takes guts and courage to walk away from a routine, any routine, especially one that pays well :-). I am just happy I had the willpower to make things work. Oh my gosh, Vidya, I LOVE your story – I just LOVE IT, you gutsy, brave, amazing woman you! THANK YOU for sharing with us, I have seen you here and there but to know the person inside now, I feel so privileged. You are a role model! I should interview YOU one day. You are NOT doing “nothing” as you soon came to realize. You are doing important things in your life. I had been working from home a long time for my corporate job so I didn’t have to switch in a lot of senses, but alas, I did switch mentally and of course, financially. One day, Vidya, I am determined to look my corporate salary look like peanuts compared to what I plan to build. No loss. All gain. And all for beautiful amazing causes. Please stay in touch. Lots of gratitude to you. I worked for close to 10 years in a US bank ever since I graduated from the University, before I decided to resign. However, I don’t regret my working career one bit. My job stinct allowed me to try a wide range of options. I was very lucky to get a good salary compared to my peers, right from the first day of work. The path to entrepreneurship has not been easy. There is so much to address, not just the technical aspects. The mind shift is very important too. Also, it cannot be just about taking a blind leap when there are family concerns. I wish I had the same guidance that someone like Farnoosh is now giving. My path would have been much smoother. Great idea to help offer some guidance, Farnoosh! Angela, thanks for the wonderful interview!! Evelyn, so nice to see you! I hear you – I remember mainly the “bitter end” in my career but I need to admit that it offered good options and good opportunities and I got to travel a lot too. Do you regret leaving, I am curious? Path to entrepreneurship is not easy, you are totally right, and also not for everyone and that is part of my course. The course is definitely *not* to encourage everyone to quit their job and start their own business, but to empower them with tools and knowledge to leave a miserable job/workplace and find fulfillment somewhere they can belong. For all I know, someone may be leaving self-employment to go work for a large corporation. I think it’s really important to know ourselves before making such moves too, and that’s a huge part of the course….! Thanks so much for your thoughts! Farnoosh is a force of nature! Great interview. I’m always happy to learn more about people I admire. Too sweet and kind, Galen. I am blushing and truly happy to have your sweet support, thank you and I hope 2012 is good to you so far! Thank you for having me here, Angela! 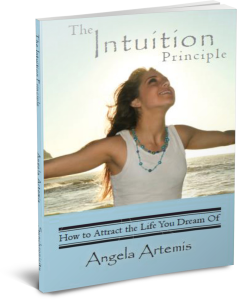 You know well that after I listened to my intuition, I started to embrace so much success and freedom. You are amazing in advocating for listening to our inner voice and I know I would not have landed on my dream path, had I kept ignoring it. Thanks for having me featured here! You’re so welcome! 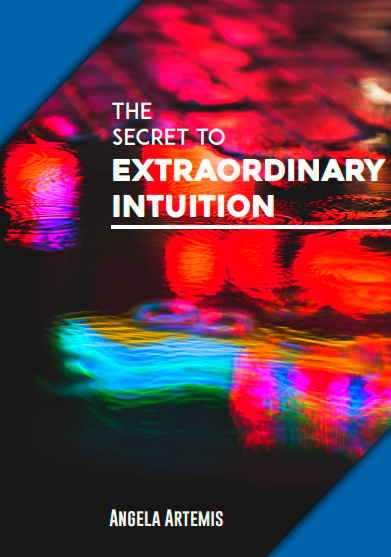 You shared some real life experiences with intuition that are invaluable to Powered by Intuition readers. I do hope someone will take advantage of the great course you created as well! I’m on my 3rd escape from Corporate America…..I hope this one sticks though!